All work and no play makes Remi a dull boy. Meanwhile, if you spend a spell in Chadds Ford…why they heck don’t you check out the following, for crying out loud?! This entry was posted in Day Tripping Series, Inspiration and tagged Antique Typewriters, Antiques, Brandywine River Museum, Chadds Ford, Chadds Ford Antique Mall, Chadds Ford Restaurant & Pub, Chadds Ford Winery, Day Trips, Day-Tripping, Pennsylvania, Remington Typewriter, Stories, Storytelling, Typewriter, Writing. Exquisite stuff. Looks like a good ol’ chap. Vintage never goes out of style, eh? One look at it and I feel like it’s pleasantly haunted. Say if you type a poem and end on a rhyming note the typewriter produces an extra ‘ching’ sound. Or when you type ‘The End’ it automatically moves to the next line and stops working until the paper is changed. I know, sounds more Stephen King’ish’ than ‘Wordsworthy’. Sally wasn’t nearly as pretty as the other reporters at the Local Bee Newspaper, which is probably why she was sequestered to the gardening section. No local sports figures to be distracted, gawking at her malformed arm. No local politicians would flirt with someone with one leg dramatically shorter than other. No local vapid celebrity would chat with her because of her eye patch. What Sally lacked in depth perception, she made up with ability to write glamorous, beautiful prose to describe her world’s two dimensions. To further stand out, Sally dismissed modern tools of her trade. 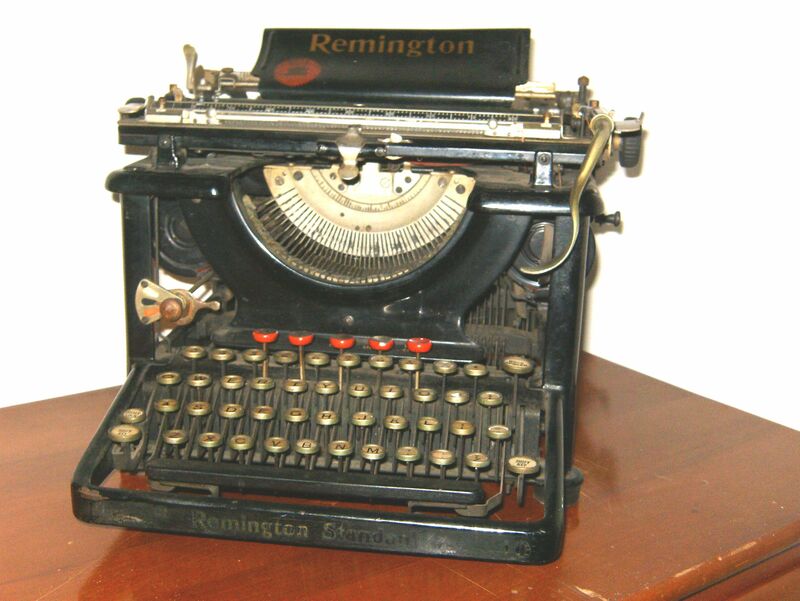 While reporters walked around with their suitcase-sized, company-issued IBM Convertibles, Sally preferred the sound and company of her “Remmi” a Remington typewriter. Sally sat Remmi onto the windowsill and pulled up her chair to muse about her latest addition to her garden. Four flights down, a small crop of Solanum nigrum or “Sunberries” seemed to smile at the sound of Sally’s fingers carefully drumming on Remmi’s keys. Confident that she had written another great addition to the Local Bee, Sally went up to refill her coffee cup. Returning to her bright perch, she was horrified to find that Remmi was gone. Upon further investigation, she discovered Remmi four floors down, at the bottom of a 6″ deep crater, on top of an idiotically grinning bouquet of Sunberries. One more thing, the year is 1987. Forgot to add that tidbit, my apologies. I know Dave, really should have done something more to develop the time other than the allusion to “portable” computers. Perhaps using news stories from the time. Politician = Oliver North, celebrity = Jim Baker, etc. That’s what I get for being impulsive I suppose. Not bad, but I was thinking more Amy Sedaris, but that’s only because I hate her brother and I’d make Remmi fall on him first. The year was 1916, and the place was Mr. Parker’s Thrift Shop on the Harvard University Campus. Mr. Parker’s shop was on the edge of the campus on a quaint, tree lined street. To the right of Mr. Parker’s shop was an apothecary, to the left a coffee shop, and across the street was the campus book store. It was dawn, and Remi watched from the front window of Mr. Parker’s shop as the street lights dimmed and the sun began to reflect off the book store window from across the street. Remi enjoyed the view; but,today was different. A young man was peering in the window and pacing back and forth in front of the shop, anxiously waiting for Mr. Parker to open. As Mr. Parker opened his front door, the young man practically knocked down the older Mr. Parker in his rush to enter the store. He was a University student and he asked Mr. Parker if Remi was for sale. The young man explained he needed a typewriter TODAY for his poetry class. Mr. Parker removed Remi from the window and placed him on the counter; but explained to the young man that Remi was missing his “shift keys” and could only type in lower case letters, with limited use of the punctuation marks. (This is where Mr. Parker usually lost the sale.) But today, the young man smiled and said that Remi was just what he was looking for. He took out his check book and wrote Mr. Parker a check for $35.00.